^ Found in Aristoteles' work: De Anim. Hist., Lib: IV Cap: I. ^ a b J. Mark Rowland & John A. L. Cooke (1973). “Systematics of the arachnid order Uropygida (=Thelyphonida)” (PDF). Journal of Arachnology 1: 55–71. http://www.americanarachnology.org/JoA_free/JoA_v1_n1/JoA_v1_p55.pdf. ^ “Geological history and phylogeny of Chelicerata” (英語). Arthropod Structure & Development 39 (2-3): 124–142. (2010-03-01). doi:10.1016/j.asd.2010.01.003. ISSN 1467-8039. https://www.sciencedirect.com/science/article/pii/S1467803910000046. ^ SHULTZ, JEFFREY W. (2007-06). “A phylogenetic analysis of the arachnid orders based on morphological characters” (英語). Zoological Journal of the Linnean Society 150 (2): 221–265. doi:10.1111/j.1096-3642.2007.00284.x. ISSN 1096-3642. https://onlinelibrary.wiley.com/doi/full/10.1111/j.1096-3642.2007.00284.x. ^ a b c d e f g h Günther Schmidt (1993) (German). Giftige und gefährliche Spinnentiere [Poisonous and dangerous arachnids]. Westarp Wissenschaften. ISBN 3-89432-405-8. ^ a b Watari, Yuya; Komine, Hirotaka (2016). 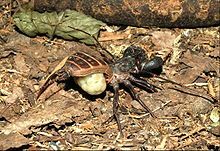 “Field observation of male-male fighting during a sexual interaction in the whip scorpion Typopeltis stimpsonii (Wood 1862) (Arachnida: Uropygi)” (英語). Acta Arachnologica 65 (1): 49–54. doi:10.2476/asjaa.65.49. ISSN 0001-5202. https://www.researchgate.net/publication/309623689_Field_observation_of_male-male_fighting_during_a_sexual_interaction_in_the_whip_scorpion_Typopeltis_stimpsonii_Wood_1862_Arachnida_Uropygi. ^ a b c Garwood, Russell J.; Dunlop, Jason (2014-11-13). “Three-dimensional reconstruction and the phylogeny of extinct chelicerate orders” (英語). PeerJ 2: e641. doi:10.7717/peerj.641. ISSN 2167-8359. https://peerj.com/articles/641/. ^ P. Weygoldt (1979). “Thelyphonellus ruschii n. sp. und die taxonomische Stellung von Thelyphonellus Pocock 1894 (Arachnida: Uropygi: Thelyphonida)”. Senckenbergiana Biologica 60: 109–114. ^ J. Haupt & D. Song (1996). “Revision of East Asian whip scorpions (Arachnida Uropygi Thelyphonida). I. China and Japan”. Arthropoda Selecta 5: 43–52. ^ J. A. Dunlop & C.A. Horrocks (1996). “A new Upper Carboniferous whip scorpion (Arachnida: Uropygi: Thelyphonida) with a revision of the British Carboniferous Uropygi”. Zoologischer Anzeiger 234: 293–306. ^ M. S. Harvey (2002). “The neglected cousins: what do we know about the smaller arachnid orders?” (PDF). Journal of Arachnology 30: 357–372. doi:[[doi:10.1636%2F0161-8202%282002%29030%5B0357%3ATNCWDW%5D2.0.CO%3B2|10.1636/0161-8202(2002)030[0357:TNCWDW]2.0.CO;2]]. http://www.americanarachnology.org/JoA_Congress/JoA_v30_n2/arac-30-02-357.pdf. ^ Regier, Jerome C.; Shultz, Jeffrey W.; Zwick, Andreas; Hussey, April; Ball, Bernard; Wetzer, Regina; Martin, Joel W.; Cunningham, Clifford W. (2010-02). “Arthropod relationships revealed by phylogenomic analysis of nuclear protein-coding sequences” (英語). Nature 463 (7284): 1079–1083. doi:10.1038/nature08742. ISSN 0028-0836. https://doi.org/10.1038/nature08742. ^ Barrales-Alcalá, Diego; Francke, Oscar F.; Prendini, Lorenzo (2018-02). “Systematic Revision of the Giant Vinegaroons of the Mastigoproctus giganteus Complex (Thelyphonida: Thelyphonidae) of North America” (英語). Bulletin of the American Museum of Natural History 418: 1–62. doi:10.1206/0003-0090-418.1.1. ISSN 0003-0090. https://www.researchgate.net/publication/322881558_Systematic_Revision_of_the_Giant_Vinegaroons_of_the_Mastigoproctus_giganteus_Complex_Thelyphonida_Thelyphonidae_of_North_America. ^ JC Huff, L Prendini (2009). “On the African Whip Scorpion, Etienneus africanus (Hentschel, 1899) (Thelyphonida: Thelyphonidae), with a Redescription Based on New Material from Guinea-Bissau and Senegal”. American Museum Novitates 3658: 1-16. doi:10.1206/674.1. ^ Huff, Jeremy C.; Víquez, Carlos; Prendini, Lorenzo (2008-12). “Redescription of Mimoscorpius pugnator (Butler, 1872) (Arachnida: Thelyphonida), with first description of the female” (英語). American Museum Novitates 3633: 1–9. doi:10.1206/640.1. ISSN 0003-0082. https://www.researchgate.net/publication/232679843_Redescription_of_Mimoscorpius_pugnator_Butler_1872_Arachnida_Thelyphonida_with_first_description_of_the_female. ^ a b c Orin McMonigle (2008). Whipscorpions and Whipspiders: Culturing Gentle Monsters. Elytra and Antenna Insect Books. 40pp.